The Leadership Journal Club is a new initiative to expose residents and fellows to broad topics of organizational leadership. The purpose is to help in preparing trainees for leadership roles within health systems of the future. The journal club will focus on transformative articles in the leadership literature as well as case studies on actual business decisions. The journal club is led by Dr. Meltzer with Mike Kassin (R2) serving as the resident liaison. The Breast Imaging Center (BIC) at EUHM participated in the "Healthy New You Expo" in January which was sponsored by Emory’s Faculty Staff Assistance Program (FSAP). The event was held in the Glenn Auditorium. Deanna Green, Nurse Clinician had a great time meeting potential new customers, greeting old customers and passing out informational brochures, trinkets and smiles. The BIC team represented the breast imaging department so well; and thanks to Dr. Seidel for supplying the candy and for putting the poster board together. The table looked great! 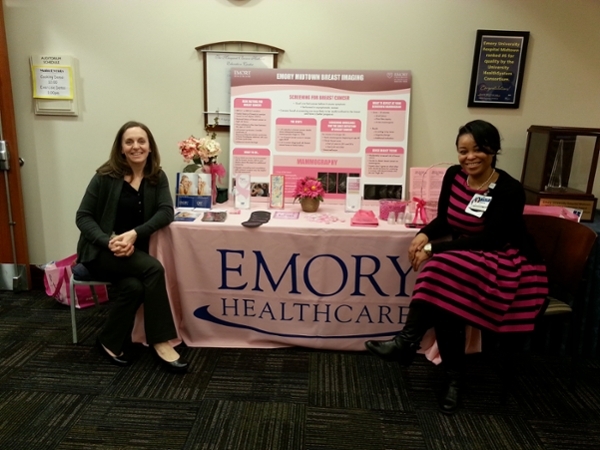 We are looking forward to getting out into the community more and spreading the word about the Breast Imaging departments at Emory Healthcare.